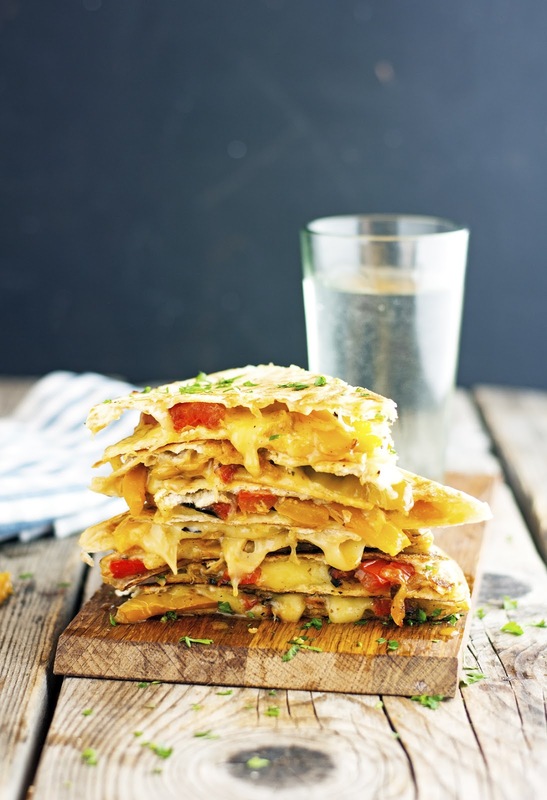 It’s about time you meet one of my fave go-to meal, Pepper Quesadillas. When I’m feeling too lazy to make a proper meal but I still want something delicious, filling, and a tad on the healthy side too, I throw together these quesadillas in 15 minutes flat. These Pepper Quesadillas are packed with veggies (bell peppers to be exact) and have tons of flavor. I make them with whole-grain tortillas for some nutritional bonus point and add enough cheese to make sure they’re both appetizing and delicious. The bell peppers are quickly roasted in a skillet over high heat. Then seasoned with cumin and lime juice to get a bit of Mexican flare. So delicious. Just make sure your pan is large enough to accommodate the quesadilla lengthwise, so it can get golden brown and awesome from end to end. Also don’t over stuff it, though you’ll be tempted to — the stuffing will fall out, and you’ll end up with hot cheese dripping down your chin. Awkward, some like it though. 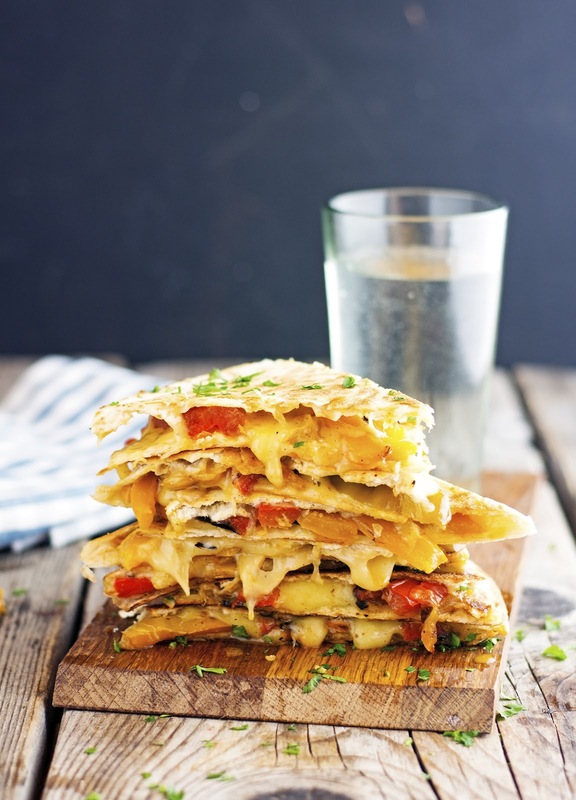 These Pepper Quesadillas are so delicious they’re bound to please kids and adults alike. So what are you waiting for? Make it for next dinner and watch your family's face lit up with glee. Pepper Quesadillas Print this recipe! Heat oil in a large skillet over high heat until sizzling hot. Add the peppers, and DO NOT stir. This allows the peppers to get the brown roasted look on the outside. Cook for 3 minutes, stir and cook for another 3 minutes (again without stirring). Sprinkle with salt, cumin, chili (if using), and pepper. Add lime juice, give a good stir and cook for 1 further minute. Remove from the heat and set aside. In a large skillet sizzle ¼ teaspoon of over medium heat, lay a tortilla in it, and sprinkle all over with ½ cup of cheese. Spread roughly a layer of peppers over just half the tortilla. Don't use too much or the filling will fall out as you try to eat it. Spreading the filling over half makes the quesadilla easier to fold. Once the cheese starts to melt, begin lifting a corner of the tortilla and checking the underside. When the cheese has completely melted and you see golden-brown spots on the underside of the tortilla, the quesadilla is ready. Use the spatula to fold the quesadilla in half, sandwiching the filling. Flip the quesadilla and press it down with a spatula. 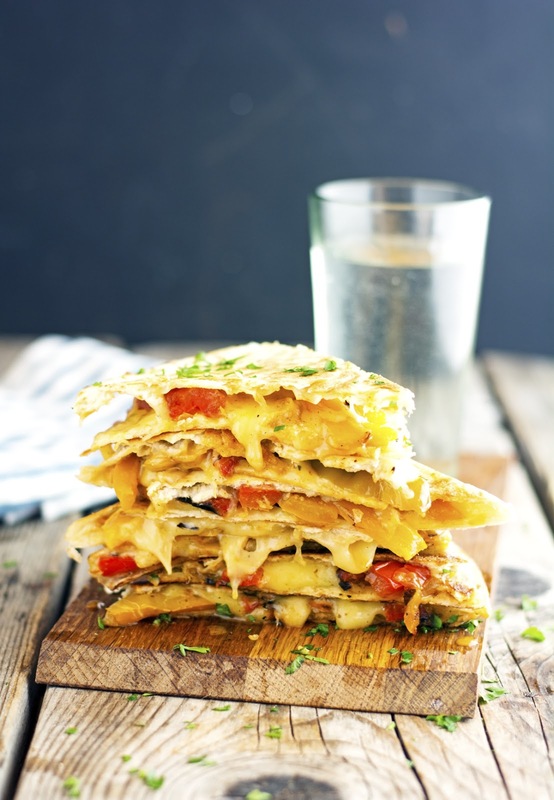 Slide the quesadilla to a cutting board, and if serving immediately, slice into wedges. If preparing several quesadillas for a crowd, slide the un-cut quesadillas onto a baking sheet and keep warm in a 200°F (100°C) oven and then slice into wedges and sprinkle with chopped fresh cilantro (if using) just before serving. One quesadilla yields 437 calories, 27 grams of fat, 33 grams of carbs, and 18 grams of protein. Doesn't this look amazing! I could go for this right now! Yum I love roasted peppers! And all that melty cheese...definitely keeping this in mind for quick, easy dinners! I love the addition of cumin and lime!